It’s still nearly impossible for me to believe that art galleries, businesses and area restaurants in Asbury Park, New Jersey were under three feet of water from Hurricane Sandy just ten weeks ago. Executive Director of The Shore Institute of Contemporary Arts (SICA) gallery, Doug Ferrari, explained to me as I was dropping off my piece for the upcoming group show of how this Central NJ shore town pulled together in this tragedy to save whatever they could, as businesses and local residents scrambled to save business and personal property alike. Juror Maiza Hixson, Gretchen Hupfel Curator of Contemporary Art at the Delaware Center for the Contemporary Arts (DCCA) has curated a most impressive array of works that instantly shows absolutely no fear of being labeled complacent or merely just another group show of “attractive pieces”. Each sculpture, installation, painting or mixed media object Hixson chose exudes a confidence that has a true Whitney-esque Museum of Art/New York City flair that some viewers attending from outside of the New York metro area may find more conceptually-based. Therefore, it encourages one to look for further meaning on issues the artists address in their work, than say, what art one may be used to seeing typically in a suburban art gallery in New Jersey. Mark Kolessar’s “Second Skin” speaks of dichotomies of inner human workings vs. the “costume” or outfitting that we wear daily. Is there a gender question here of what makes us different as opposite sexes? Or rather, I see this as a comparison of what one may project as an image to the socializing world (right side) vs. the true intimacy of coming home at the end of the day, standing in one’s bedroom of wallpaper and artificial light, baring all as you change clothing (left side). Kolessar’s use of found objects and paint is brilliant here, but the folding diptych of wallpaper vs. solid paint background that is echoed on the shoebox is equally as clever. Jill Kerwick: “Doris at Home”. Archival photocollage, 9″ x 9″, 2012. 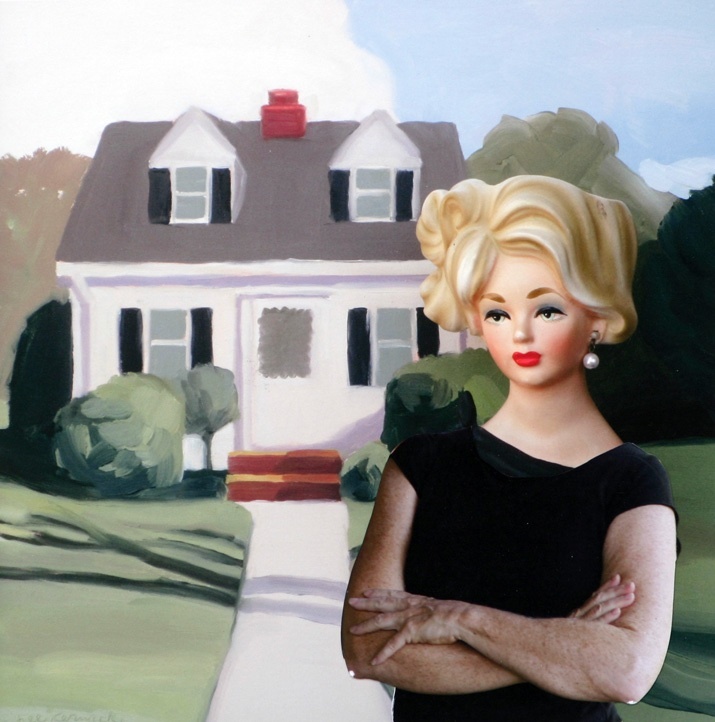 Jill Kerwick’s Doris at Home shows the typically comfortable suburban housewife, but in a humorous twist, the attractive blond hair and youthful makeup is juxtaposed against aging freckled skin and flabby arms. When I first saw this piece, I loved the humor in it, but later realized that there’s much more depth to this portrait than initially thought. Kerwick, a New Jersey artist, has an entire series of works in oil painting and collage featuring her character, “Doris”. She is a featured artist in the NYC’s The Drawing Center Viewing Program, where one can see various incarnations of Doris and other pieces of Kerwick’s fascinating portfolio. 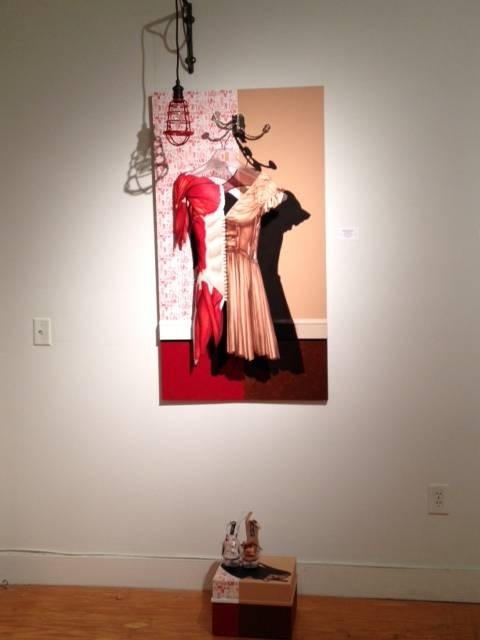 Brooklyn-based artist Sam Tufnell exhibited three pieces in the show, but Still Life #2: (The South Beach Diet) was installed directly across from where one of my Widget Lockets was displayed in the gallery. The bright green patina of the objects captivated me as I deciphered each object: a Starbucks or other brand’s coffee cup, Red Bull drink (possibly), some sort of Art Deco designed vodka/gin bottle, a rubick’s cube, crushed beer cans, a fountain soda – and a scattering of Hershey kisses chocolates. 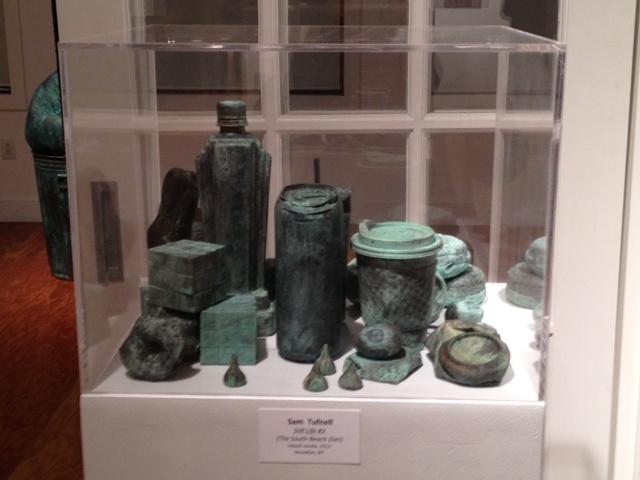 But as one consumes these items, Tufnell is commenting on the deterioration that consuming these must do to our bodies – hence the decaying green patina on the objects. Does living life in the fast track of a glamorous place like South Beach ultimately end up with a moral or bodily decay? As an aside, having just discussed the prevalent Art Deco-style architecture found in Miami Beach recently with a friend, I can’t believe how fitting a choice Tufnell’s inclusion of a Deco-inspired spirits’ bottle truly is. Certainly not a detail that has gone unnoticed. The Shore Institute of Contemporary Arts’ Ninth Annual International Juried Exhibition continues through January 26th, 2013 at 610 Cookman Avenue in downtown Asbury Park, New Jersey. This exhibit features 43 works of art by approximately 21 artists that juror Maiza Hixson chose from over 467 submissions. Except where noted otherwise, images used are courtesy of the artist. Thank you for showing us this exhibition. It was a fascinating read and although it isn’t the same as being there it does come a close second in the way my mind starts musing and allows itself to be led in the interesting directions the Art Works lead it. LOVE the “South Beach Diet” on all levels. Thank you gentlestitches for your wonderful insights; you are correct in so many ways, esp. how one image of the artwork fails to show how much depth there is to each piece and artist’s intent. Also, I loved “The South Beach Diet” piece as well – just too much to talk about here! Thank you so much for your post; I did not know the artists featured in your review. Jill Kerwick’s collages are charming and whimsical, but thought-provoking too. There is substance – depth, as you say – in all of these pieces. I agree with gentlestitches, it’s not the same as seeing the show, but it does open up new horizons. Dominique – I’m so glad you stopped by. You always seem to understand exactly what I’m trying to communicate here. I really enjoyed the “Doris” piece myself!! I thought initially this character could only have sprung from the suburban lifestyles of northern New Jersey, but in fact, others who live in completely different parts of the world have told me privately how familiar an entity she is to them, as well. Thanks again for your lovely feedback! I enjoyed reading this post, Patricia. Congratulations on your inclusion in this highly competitive show. I love how you write about art — I always look forward to reading your posts. Anita, thanks so much. It really was a fantastic experience all-around to exhibit with such a diversity of media and artistic styles. I typically love conceptually-based work because I find a never-ending amount of aspects to really “dig down deep” and write about. I truly appreciate your visits to my blog – you are always welcome to stop by! This is interesting Patricia. The South Beach Diet gives a gravitas to the junk of junk-food – something about the patina perhaps? And how amazing that parts of life look and feel like normal after all that happened in those parts. Congratulations on being selected for this show! I like that – “the ‘junk’ of junk-food” – I’m going to have to remember that! And yes, it was so wonderful see how all the residents and business owners of Asbury Park pulled it all together so well after Sandy cleared out. This is certainly not a part of the U.S. that normally has any dealings with hurricanes, let alone one of that magnitude. Thanks Philippa for stopping by and esp. for your lovely comments! So I wanted to talk more about the other fantastic work I saw at the opening. Thanks so much Dawn for stopping in – I appreciate it! !